"She tasted the first sweet potato pie, 'This is too grainy! Like mashed potatoes in a pie crust.' She tasted the second pie, 'This is too plain, like pumpkin pie, only less so.' She tasted the third pie 'Ahh, this is just right. Strong sweet-potato flavor, but still a nice texture. Yum. Yum. Yum.'" Preheat oven to 350 degrees F (175 degrees C). Press pie crust into a 9-inch pie pan. 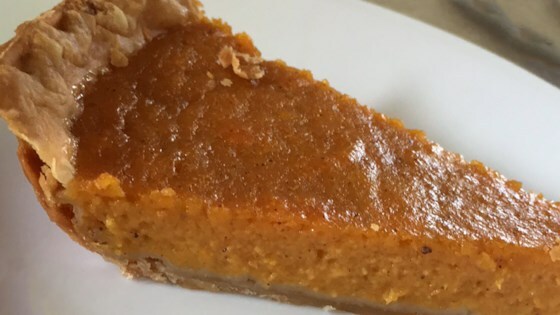 Mix sweet potatoes, sugar, butter, milk, eggs, vanilla extract, nutmeg, and cinnamon together in a bowl; pour sweet potato mixture into the prepared pie crust. Bake in the preheated oven until a knife inserted near the center comes out clean, about 1 hour. Was not sweet enough or dense enough. It was good just not "I'll make it again" good. Great simple recipe. I cut the sugar in half otherwise made as directed. I followed the recipe to the letter. Great texture and taste. Will be making this during the holidays and beyond. It is so much better than pumpkin pie. This was the second time I made the pie. It was delicious. Easy to make. Next time I will make homemade crust, but other than that; I followed the recipe to the T.
Added flour to thicken the filling, a touch a fresh ginger, 3/4 c white sugar and 1/4 brown sugar. One of the best pies I've made.